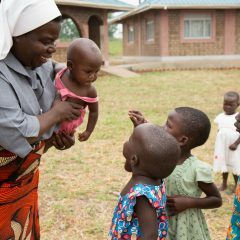 Catholic sisters work with vulnerable populations around the globe. Their faith drives their dedication to serving “the least of these,” and yet, the conditions in which they work also can cause them to feel burnt out. In this video, women religious (sisters/nuns) report that maintaining a healthy spiritual life—through regular prayer, retreats, spiritual direction and counseling—is essential to sustaining their vitality and their ministries to the poor. Interviews in the video were conducted as part of CRCC’s Measurement, Evaluation and Learning Project for the Conrad N. Hilton Foundation’s Catholic Sisters Initiative.